OZEN by Atmosphere at Maadhoo opened its shores to the world on 15th July 2016 – as per promise! Located in South Male’ atoll, OZEN is the 3rd inclusion within the Atmosphere Hotels & Resorts portfolio. A stunning Lifestyle Luxury resort, OZEN has also introduced a uniquely exclusive Luxury All‐Inclusive holiday plan – the Atmosphere INDULGENCE™, which offers the discerning traveler a blissful hassle‐free holiday experience, encompassing ALL aspects of a Luxury Holiday in the Maldives! Atmosphere Hotels & Resorts, now renowned worldwide for creating unique experiences, has now launched an Exotic Underwater Dining Experience at OZEN. 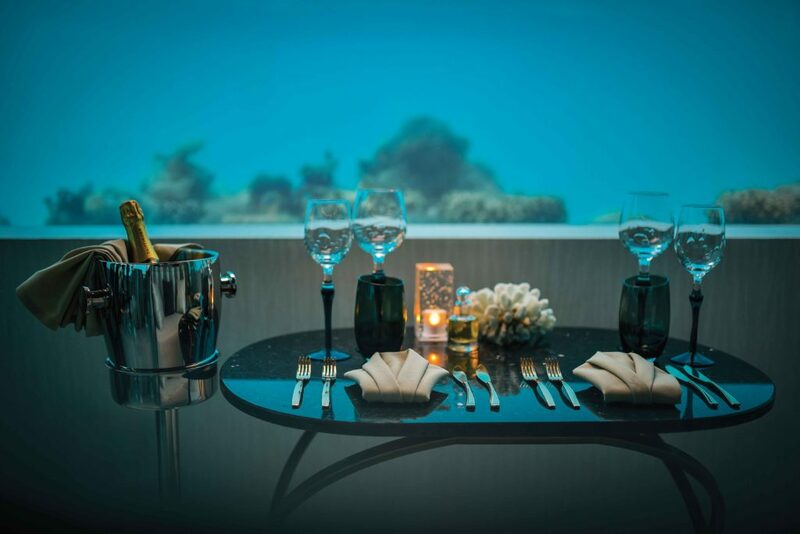 Aptly named M6m (acronym for Minus Six Meters), the underwater restaurant in addition to offering some mesmeric views of the underwater world around, also offers gourmet, fine dining modern Seafood cuisine. Led by the creative, passionate and young Executive Chef – Mr. Arun Katoch together with M6m’s very own Master Chef Mr. Chaitanya Sharma & his extraordinary culinary team, M6m strives to deliver some of the finest Modern Seafood cuisine in an absolutely mesmeric underwater space! The cuisine creation, vibrant design & amazing presentations showcase the exemplary use of fine‐dining cooking techniques with quality ingredients, whereby drawing a fine line between Gastronomy and Art! Atmosphere Hotels & Resorts launched its first resort in December 2013 as Atmosphere Kanifushi Maldives – a 5‐star Premium All‐Inclusive resort, following which, opened a trendy & cool 4 Star Superior resort – OBLU by Atmosphere at Helengeli in November 2015. Both the resorts have been a roaring success since the start of operations and have established & positioned themselves as market leaders within their specific market segments.